The Association of Women in International Trade (WIIT) in partnership with the U.S. Chamber of Commerce’s Global Innovation Policy Center (GIPC) invites you to a breakfast discussion on how intellectual property (IP)-led innovation has revolutionized sports and fashion industries. IP most certainly can be a very technical concept; but our featured speakers will talk about it in our daily lives. Please join us as we talk with Chanel, NFL, and Under Armour about the business of sports and fashion—and how they inspire innovation and creativity through their brands. The event will also feature findings from the U.S. Chamber’s study on the global sports economy and the 2019 IP Index. Light breakfast fare will be served. Director, Assistant General Counsel, Chanel, Inc.
Jennifer Bleys is Director is Assistant General Counsel at Chanel, Inc. in NY, NY. Jennifer protects Chanel’s valuable IP rights through various anti-counterfeiting and anti-diversion functions throughout the U.S. and Canada. Jennifer spends her days fighting counterfeits both online and off – managing the balance between targeting the biggest threats and minimizing visibility. Jennifer lives in Manhattan with her husband and son. Dolores F. DiBella is Vice President of Legal Affairs for the National Football League, where she has managed intellectual property, rights enforcement, commercial litigation, and employment matters for the NFL since 2012. She received her Bachelors in Government from Georgetown University, and her juris doctor from Columbia Law School. 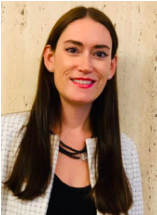 After graduating from Columbia, Ms. DiBella was a litigation associate at Proskauer Rose LLP, where she specialized in intellectual property and entertainment law, and handled a variety of commercial litigation matters. She is a frequent guest lecturer and former adjunct law professor. 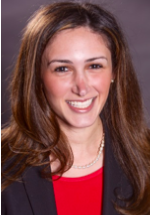 Dayna Frenkel is Associate Counsel, Trademarks at Under Armour, Inc. in Baltimore, Maryland. Dayna develops and provides strategic guidance on brand protection strategies for one of the world’s largest sports brands. She is solely responsible for advising the footwear team from innovation through implementation by addressing design concerns, product naming, and approving marketing creative. Dayna also supports the sports marketing team with all IP issues relating to Under Armour’s sponsored athletes. In collaboration with the global marketing team, Dayna reviews and advises on global brand campaigns, including advertising and product claim compliance. Prior to joining Under Armour, Dayna was an associate at Foley & Lardner in Milwaukee, Wisconsin where she counseled clients of all sizes on trademark, copyright, and marketing issues. Ellen Szymanski is executive director of international policy for the Global Innovation Policy Center (GIPC) at the U.S. Chamber of Commerce. Before joining the Chamber, Szymanski worked for eight years in the Office of China and Mongolia at the U.S. Department of Commerce where she managed U.S.-China trade policy development, negotiation, and implementation. Previously, Szymanski practiced law at Graham and Dunn in Seattle and served as general counsel at Gene Juarez Salons and Spas. Szymanski earned a law degree and Master’s of Asian studies from Washington University in St. Louis and a bachelor’s degree from Boston University. She and her husband live in Northern Virginia with their three sons. Kasie Brill is the senior director of brand protection at the U.S. Chamber of Commerce’s Global Innovation Policy Center (GIPC) and the Executive Director of the Global Brand Council. Kasie advocates for the protection of IP rights both online and in physical markets with a special focus on designing public policy solutions to combat counterfeit goods. Prior to joining the Global Intellectual Property Center, Kasie served as an advisor to private sector clients fighting illegal online pharmacies. She also served as law clerk to The Honorable C. Ray Mullins, Chief Judge for the United States Bankruptcy Court for the Northern District of Georgia, Atlanta Division. Kasie is a graduate of both Michigan State University and the Indiana University Maurer School of Law. Kasie is a young leader on the Indiana University Maurer School of Law’s Washington D.C. Alumni Chapter and participates as a member of the Junior League of Washington.